Fontainebleau Children’s Academy provides unique education and curriculum for children ages 6 weeks to 5 years old. Our programs are tailored to encourage each child cognitively, emotionally, socially, and physically within their respective, age-appropriate classroom. The methodology that drives early childhood development in our classrooms comes from the Frog Street curriculum. 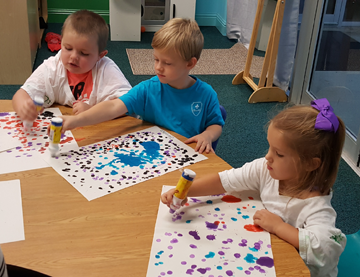 Frog Street’s programs provide instruction backed by the latest scientific research that incorporates both cognitive and physical stimulation that is tailored to each age group at Fontainebleau Children’s Academy. Frog Street is a Top Tier rated curriculum by the Louisiana Department of Education and follows the Louisiana Birth to Five Year Developmental Standards. These award winning programs are built on the cornerstones of early brain development research, Intentional Instruction, Developmental learning domains, and Social and Emotional Development. Activities include songs, music, games, immersive and dramatic play, and self-expression through artistic mediums just to name a few. We utilize Frog Street because it provides a comprehensive curriculum that sets a strong educational foundation for your child to grow their thinking and reasoning skills, among other learning tools that will prepare them for success in school and life. At Fontainebleau Children’s Academy, you and your child will experience an inclusive environment that celebrates diversity. Each child receives an education that focuses on the age and stage they’re at. If you would like to learn more details and schedule an appointment to discuss our programs here, give us a call today.